Subaru is growing in popularity thanks to its stylish design and its sporty performance. When you have an accident in your Subaru, it’s important that you find a certified body shop that can expertly perform the repairs and give you the results you need to make your vehicle safe and protect your investment. Excel Collision and Glass Centers has a certified Subaru body shop in Mesa with highly trained and experienced technicians who can restore your vehicle to like-new condition. You’ll think we performed magic, not collision repair! You’ll get priceless value and will have an exceptional experience when you bring your Subaru into Excel Collision and Glass Centers for body repair. You’ll know the difference in our service the moment you call to make an appointment or ask a question. Our dedicated staff go above and beyond to try to exceed your expectations. Widely known for their racing cars, Subaru vehicles are slowly getting more popular in the streets. Whenever you are going to need a repair collision center for your Subaru, not many places have the parts necessary for doing complete repairs on this brand. Thankfully, Excel Collision Center is Subaru certified, meaning that we have original manufacturer parts that will last for a long time compared to their aftermarket counterparts that can be made in any part of the world. We are ready for your Subaru in all our convenient Mesa locations. Since Subaru vehicles are aimed at people that want more speed in affordable sports cars, these cars have specially modified engines for outdoor driver enthusiasts. The skilled mechanics at our collision repair centers has the knowledge and experience to handle the repairs of all the damaged parts of a Subaru car, including the engine. As a Subaru Certified collision repair center, we only work with affordable original manufacturer parts instead of aftermarket ones to make your vehicle more durable, since some aftermarket parts come from distant parts of the world without any certification. Subaru models tend to have a frame designed for more aerodynamic efficiency while driving, to reach fast speeds. When these type of vehicles have their dents, scratches, and bumps repaired and removed, the shape of the body part can be modified by accident, breaking the original design of the car. The skilled mechanics at Excel Collision Center can carefully remove and repair any dent without changing the original design of your vehicle, like it was never damaged in the first place. VISIT ONE OF OUR CONVENIENT MESA LOCATIONS TODAY! 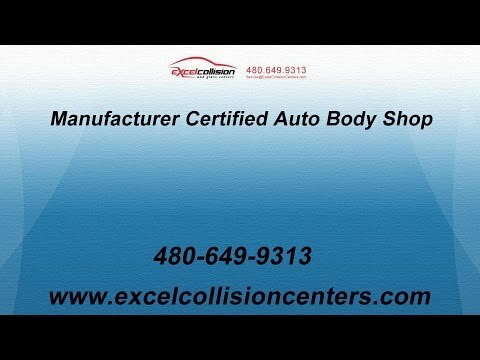 EXCEL COLLISION IS ALSO A CERTIFIED HONDA AUTO BODY REPAIR SHOP IN APACHE JUNCTION! Excel Collision and Glass Centers maintains numerous locations throughout Arizona, including in Mesa. You can visit our auto body shop in Mesa, or you can schedule service at another shop that is closer to your home or work. We do everything we can to make your visit an easy one and to minimize the disruption that bringing in your vehicle for repairs can cause. We can help to file your insurance claim, arrange for pickups and drop offs and more. We also maintain extensive hours so that you can easily fit your repairs in around your schedule. You never have to worry about the quality of the repairs you get when you bring your Subaru to Excel Collision and Glass Centers. You can read our excellent reviews and talk to our many satisfied customers to know what to expect. In addition, you can feel confident thanks to our lifetime warranty. We guarantee that the collision repair you get from our trained technicians will be free of defect for as long as you own the vehicle — and don’t get into another accident, of course. If any issues do arise, you can bring your vehicle back for a free repair. You won’t find many other body shops that make that promise. Call Excel Collision and Glass Centers in Mesa today to schedule an appointment to get a free estimate for your collision repair. We’re ready to show you why we are the best body repair shop in Mesa and start building a life-long relationship with you. Find out why our customers love us so much! "You have taken great care of me and my car. You always go above and beyond the call of duty!" "Vehicle fixed quicker then expected. Could not even see the repair."